Well, it is 2015, so…time for my annual report on my continued effort to remain healthy and active as the years roll by. So, for those who for some reason think I should only write on theology, you may skip on to other things now. For the two dozen folks who have actually found my workout posts encouraging and helpful, I will have to keep this one brief. Now, immediately, one notices about 1850 miles less on the bike, and more than 100,000 ft. less of ascent. Sounds like I mailed it in for the year! But, that would be a misreading of the facts. I can say with confidence that 2014 was my best year on the bike, bar none. The number of PRs (Personal Records) I set this year blew me away. 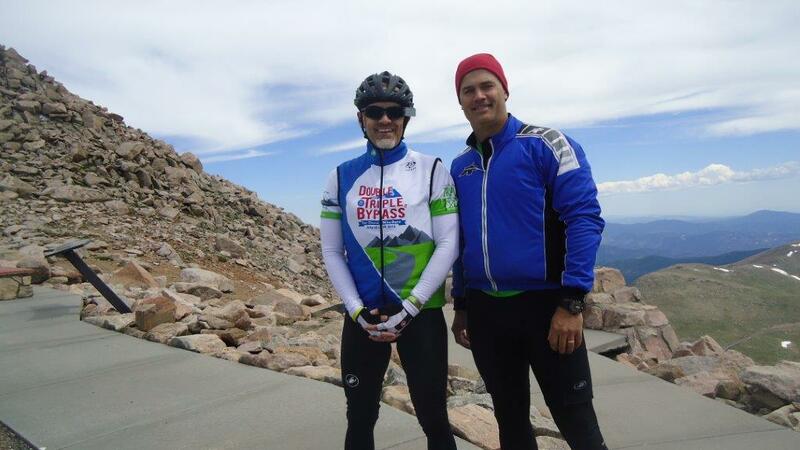 Starting with El Tour de Mesa, continuing into setting a new PR ascending Snow Bowl in Flagstaff, PR’s at the top of Mt. Lemmon, and taking an hour and fifty minutes off of my time in the Double Triple Bypass, I surprised myself repeatedly through the course of the year. I have more 20+ average rides above 50 miles in length this year than any other, for example (solo rides, specifically). When I got back from Colorado in July I had a resting heart rate of 38 bpm and a body fat percentage of 8.3%. Somehow, I have been able to hold onto most of that high level of fitness to this point, for I pulled a 20.07 average speed on a 47 miler just last week, and set a PR on a tough Strava segment climb as well. One of the major reasons for the ascent difference is the addition of power training to my regimen. Two dear brothers back east arranged for me to get a CycleOps Power Beam Plus trainer as part of my honorarium for speaking. I have never been able to afford a power meter on the bike so being able to train with a power meter has been wonderful. I am able to coordinate the trainer with videos like Spinervals (Coach Troy Jacobson) and the Sufferfest videos as well. The computer adjusts the resistance on the trainer to match the workout. Let me tell you: there is NOWHERE TO HIDE on a power trainer. You either do what you are supposed to do or…die. I have truly learned to suffer on that thing. It is GREAT. I think it had a lot to do with my many PRs this year. But, of course, you don’t get any ascent riding a trainer, hence, that number suffered. However, you get the very same benefit from that kind of training that you get from climbing, so, it was a very positive addition to my training. In other words, I may have ridden 1850 miles less, but the quality of the miles I rode was increased. Quality over quantity, as they say. Of course, the biggest thing to notice in those numbers above is the addition of an entire new sport: running. I was told, after a negative incident in 1994 (got into it too quickly I now realize), not to run. So I didn’t. Until I was in Kiev in late February, and I was literally surrounded by chocolate. I had to do something! So I started running around the seminary. Didn’t have the right shoes, nothing, but I kept it up when I got back. I worked into it very slowly, fearing what had happened before. Spent a lot of money on shoes until a friend on Strava suggested the Altra Zero Drop shoe, which ended my pain and made me a runner. I did my first 10k about a month after starting, and my first solo half marathon about a month later. I really love it. I’m still a beginner (at age 52! ), and I really wish I had run those 20 years I missed, but I am making the best of things now. I covered about 420 miles in 2014—nothing in comparison to real runners, but nothing to sneeze at, either. I still have about six weeks or so before my first full 12 months is up, and I am going to try to get to a full 500 miles by then, Lord willing (and travel permitting). This week alone I am on track for 30km run, so as long as I don’t injure myself, I’ve got a good shot at it. I have devised something called a “Dry-Tri.” I am really a tri-athlete now, with rowing taking the place of the normal swimming in a triathlon. I have taken to doing Dry-tris. For example, on Saturday I plan to do a 10km run, a 5km row, and about a 30km trainer ride. Those are killer, believe me, but talk about a whole body workout! Wow. I did one today, in fact: 5km run, 5km row, 23 miles on the bike doing an uber tough Sufferfest video. 1,399 calories. Great stuff! And let’s not forget the rowing! I really love my Concept2 Model D (Black) with PM4 head. Rowing 160,000m more than last year is huge. I joined the 3,000,000 Meter Club in December, and if I do just 850,000m this year, will join the 4,000,000 Meter Club by the end of 2015. But, I have improved my rowing greatly this year. I have some good friends who have been pushing me, both here in the States and overseas. As a result, I set PR’s in pretty much all the normal distances on the rower this year. 500m (1:40.4), 1000m (3:39.5), 2000M (7:26.9), 5000M (19:26.0), 30:00 (7527m), 10,000M (39:45.5), 1 hour (14,400m) and half marathon (1:39:59.8). I’ve been rowing since 2005, so to set ALL my PRs this year again speaks to how good a year it has been fitness wise. 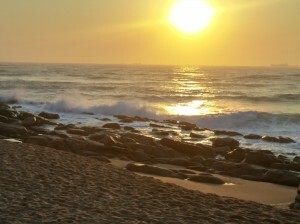 I took this shot while running alongside the ocean in Durban, South Africa at sunrise. So what about 2015? Well, that is really hard to say. I am goal oriented (can you tell? ), but at the same time, my travel schedule is up in the air, and I know I will already be overseas a good bit again this year (Norway, Zurich, South Africa). 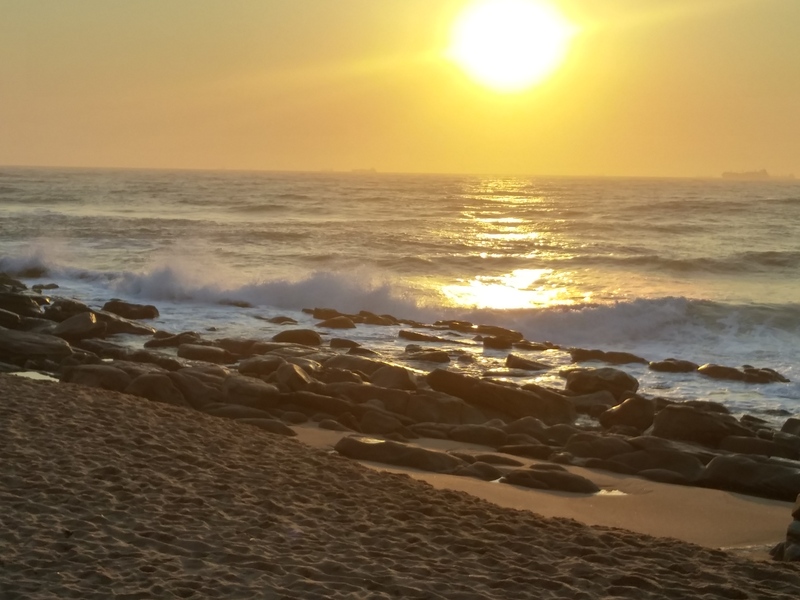 One of the main reasons I took up running was so I could keep working out while traveling (running by the sea in Durban, South Africa was an amazing experience!). I ran in 19F cold in Ukraine just a few weeks ago, and rowed at a gym in Kiev and in Berlin. So, it is really hard to set meaningful goals this early in the year. My main cycling goal this year is easy: the Mt. Evans Hill Climb in July in Colorado. I am going to try to see if I can work out doing the Saturday Triple Bypass as well (hey Colorado friends—you know who you are—how about all those plans we talked about last summer? ), but the focus will be on Mt. Evans, a real “life time” effort to be sure. Rowing wise if I do 840km I will get to 4 Million by the end of the year, and I think 800km running is a good goal as well. Of course, I am only 8400 miles from a real milestone on the bike too: 100,000 miles ridden! Hard not to think about trying to get that goal in there somehow, too! Eric Ellis and I at the top of Mt. Evans in Colorado in July, 14,160 ft. above sea level. Of course, all of this is predicated upon Deo volente: if God wills. I could be hit by a truck riding tomorrow afternoon and never run or ride or row again. I well know it. And if that happens, by God’s grace, I will be thankful for all the miles I’ve covered and accept His providence. But as long as He gives me strength and health, I will continue to press forward, using that time to study and prepare for debates, sermons, the Dividing Line, etc. It’s multi-tasking to the maximum. I love it. Let me close with sincere thanks to some of my dear friends who have helped me to get to do all of this work. Eddie McKee, Eric Ellis, Doug McMasters, Brian “the Urban Hunter with the tiny bow tie,” my Evergreen fam (Bruce and Marty Nickoley, Alan Atkins), Warren Smith, the “Gster”, Nick Leliovskyi, Thomas Hochstetter, my son Josh (who drove out and picked me up at a QT when I got caught in a massive downpour this past September)—everyone else who has assisted me in pursuit of my goals this year. Blessings to you all!